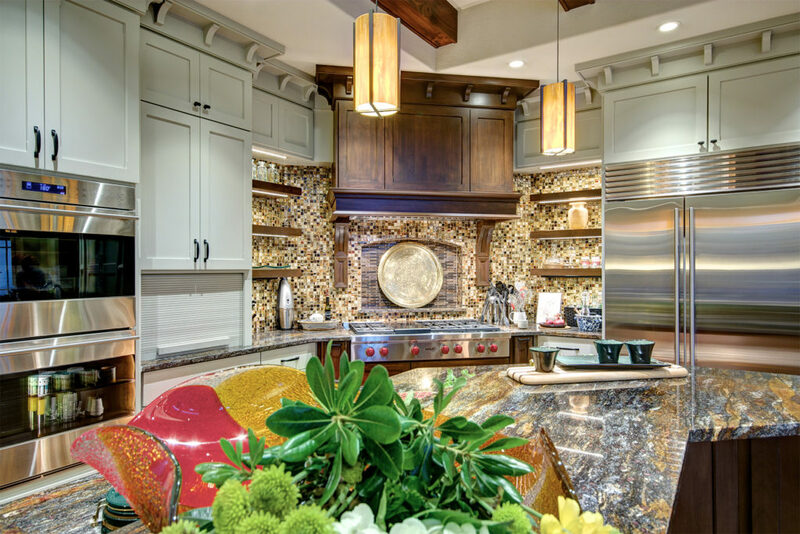 This family craved a functional yet aesthetically stunning space where they could cook together and entertain guests of all ages. Being avid gourmet cooks and wine connoisseurs, the clients requested top of the line appliances and a dedicated space for their wine collection. Among their list of “must-haves” was a connection to the adjacent living and outdoor spaces as well as a sophisticated lighting plan – complete with task, ambient and decorative lighting. Finally, since the husband and wife are drawn to the Craftsman style, they wanted to add elements of that discipline to the overall aesthetic. The new kitchen plan required removing the delineating wall between the kitchen and living room. We incorporated a horseshoe shaped island which grants logical traffic flow for the cook but still allows guests to feel connected to the chef. This horseshoe shape also provides generous countertop space for multiple tasks simultaneously. Careful thought in the placement of major appliances and work zones were taken into consideration when designing the space plan so that many activities could be taking place without a bottle-neck effect. 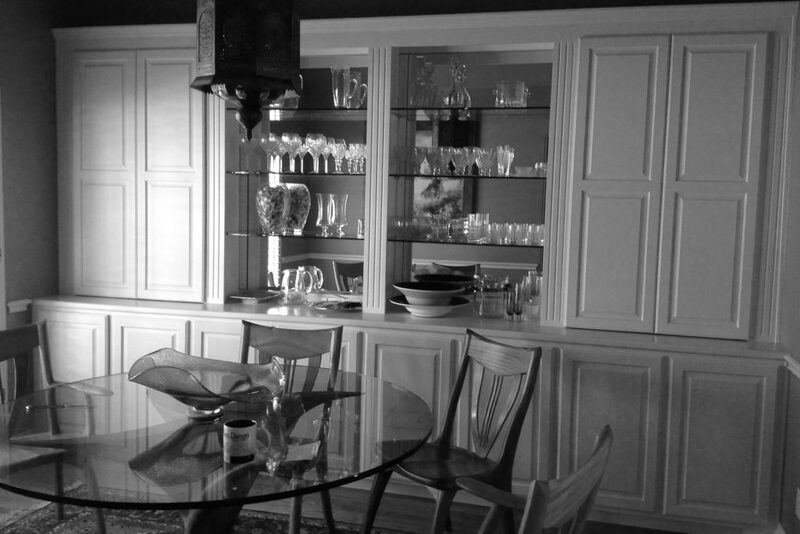 Additionally, creative use of cabinet interior elements assist with the function of the space. To name a few, our team incorporated a signature “kapoosh” knife block, spice pull outs, multiple appliance garages, and open shelving lit with LEDs to create customized storage for the families cooking habits and hobbies. To incorporate a more versatile dining space, we designed a bump-out banquette seating area. The new bench seating allows for more diners around the clients’ custom dining table and doubles as a reading nook or craft area. The benches are equipped with additional storage through lift-up seats and drawers. Moreover, the new bump-out windows, complete with “Prairie” style muntins, deliver a better visual connection to the outside living spaces while coordinating with the new full view sliding glass doors that open up on to the patio. Superior craftsmanship is displayed throughout the kitchen; from the intricate crown molding and pilaster details, to calculating all the angles and transitions in the walls and cabinetry. Structural framing for the revised footprint, sans demising wall, was a unique challenge compounded by the repositioning of the exterior patio door to a 45 degree angle. Comprehensive structural calculations & critical placement of large beams on multiple angles provide roof and framing load transitions to adjacent walls. All of these structural elements are camouflaged by custom milled, reclaimed fir beams and collar ties. Scrupulous coordination between architectural, structural and electrical design disciplines provided the opportunity to highlight the space with multifaceted lighting concepts. 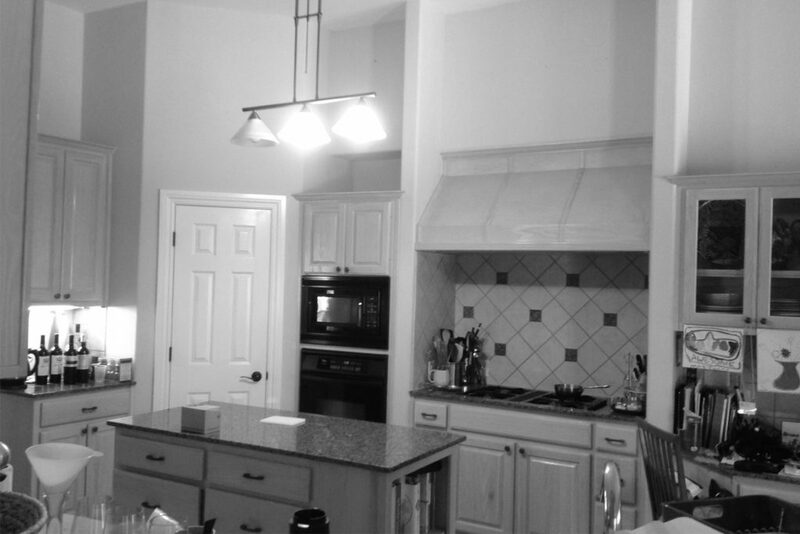 Our clients also requested an update to the existing fireplace wall to reflect the style of their new kitchen remodel. Now that the kitchen and dining spaces were be open to the living room the clients craved a cohesive design with better function for the space. Though the homeowners entertain frequently, television watching is generally not part of the agenda so they requested that the TV be hidden from view except on rare occasions. They also wanted to showcase an heirloom piano that would be strategically placed for both viewing and playing. Additionally, the fireplace, hearth, mantle, and facade needed to boast a timeless aesthetic while reflecting the owners’ affinity for the Arts and Crafts era. On the opposite side of the fireplace, we designed a wall unit that doubles as a media cabinet and display case for the homeowners’ artifacts from their world travels. The center section, which houses the TV and media equipment, incorporates an ingenious co-planer hardware that simultaneously glides up or down effortlessly with a single finger. When open, each door covers either the upper or lower section to completely conceal the adjacent cubbies, creating a whole new look to the facade. Additional drawer storage is stair-stepped below to hold movies, CDs or other items. One of the difficulties encountered by this project was carefully calculating the size and weight of the doors for the co-planer hardware in the media unit. Strict installation details were required by the manufacturer to ensure that the hardware would work properly. Furthermore, meticulous integration of hidden structural elements allowed us to minimize the encroachment of the new fireplace facade into the entertaining and lounging space while providing roof point load support. The existing under-utilized dining room was repurposed to become the formal office. Since the existing room had door or window openings on 3 of the 4 walls a desk with a “peninsula” was designed to maximize the use of the existing footprint. The “T” shaped desk not only allows traversing users to sit at the desk area at the same time, but also maximized the usage of the floor space in the middle of the room. 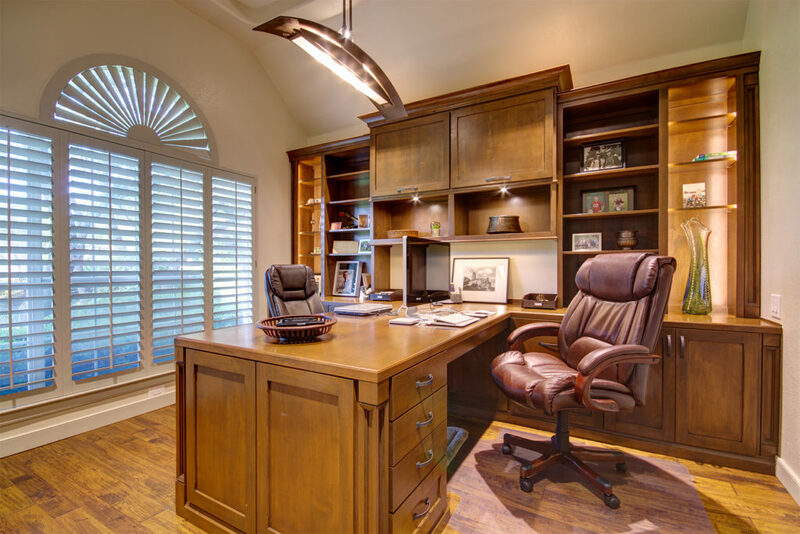 Each side of the desk top has its own set of file drawers, shelving and pencil drawer stacks. To capitalize on all usable space we incorporated a cabinet below the peninsula desk for storage of extra bulk items such as paper, file folders, and CDs. Grommets were strategically placed in the desktop to access an electrical strip below the countertop for charging electronics. The cords are neatly stowed below the desktop keeping them from getting tangled up in the knee space. An electrical outlet and a rollout printer drawer is conveniently stored within a cabinet to keep the desktop free of unsightly machines and clutter. Durable wide plank hickory flooring grounds the space while an ethereal greige (gray-green) paint adorns the walls allowing the rich hues of the alder wood to take center stage. Simple shaker doors and Arts and Crafts style pilasters and corner posts complete the design and display the clean lines of the era.